Te Kopuru is the gateway to the Pouto Peninsula and such destinations as Kellys Bay, Glinks Gully, the North Head Lighthouse, Ripiro Beach and many more interesting destinations. The picture above is a view looking across the river from opposite the old post office, Clean street is leading down to the river nd the locqation for the old wharf and the Customs office. The road to the right takes you down to Pouto, Redhill And Glinks Gulley. The two features of Maungaraho to the left and Toka Toka, site of the first pilot station, on the right dominate the river at this point. Many small settlements along the Wairoa River have an interesting tale to tell and Te Kopuru is just one of them. Constructed around the Kauri industry, in its heyday it boasted a population of well over three thousand, it had banks, a pool hall, shops, a cinema, post office and in later days a bus and taxi service. A boon to those that had always relied on the river for transport and as it was later to prove, also the death knell off river transport. Te Kopuru looking down the river, the main Dargaville-Pouto highway (Norton Street) running from lower centre diagonally left doglegs at the upper corner and then runs on towards Pouto at the upper right. The hospital is prominent on the lower right, the road to the right of the hospital grounds is aptly named Hospital Road and joins up with the Red Hill road heading to the Red Hill and the beach at Glinks Gulley. The small Dalmation settlement at Redhill is now long gone and all that remains is the cemetery which is still in use and many of the local residents are to be found there. The area is now dependent largely on the farming and horticulture industry. However tourism is starting to become important in both the local economy and the wider community as well. 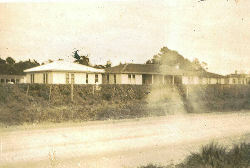 A hospital was built at the turn of the century. Many of the buildings are still standing and are being used as private residences while others have fallen into disrepair. Home stays, B & Bs' and more upmarket accommodation are starting to spring up, catering for the many New Zealand and overseas travelers who wish to experience life in the Kaipara. Many properties are being snapped up by those who are fed up with the hustle and bustle of the major towns and cities. Quiet rural living is attractive to many - the proximity of the river and beaches makes it a pleasant place to live, and the improvement of modern electronic communications make it easy to work from home. However the health needs of the locals are still being served - the Dargaville Medical Centre runs a nurse clinic on a Monday morning and a doctor and nurse clinic on a Thursday morning. Locals got together in 2009 and set up an area in the Coronation Hall suitable for the doctor and nurse to run a clinic, after the clinic had to move from its premises on Norton Street.